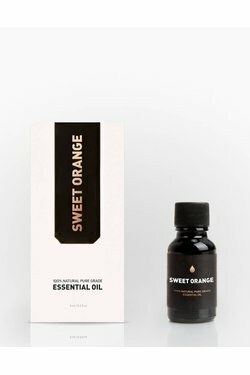 Way of Will Sweet Orange Essential Oil - Wildland Supply Co. This Sweet Orange essential oil is from Brazil--the largest orange producer in the world. Taken from the evergreen tree with sweet fruit, shiny leaves and fragrant flowers, it offers a radiant, fresh, fruity, sweet scent. Sweet Orange essential oil is energizing and is used as an anti-inflammatory, supporting good digestion. It can reduce the effects of upset stomach and gas. It is also uplifting and excellent for calming stress, insomnia and anxiety. Quick use: Want to put a smile on your face? Put 5-10 drops of Sweet Orange essential Oil in a diffuser and enjoy the bright and joyful aroma of Orange to stimulate and lift your mood. Experience through bath: Dispense 0.5ml-1ml of essential oil into a warm bath for an immersive experience. Experience through placement: Put a few drops of Sweet Orange oil on a cotton ball and put it in a corner of your bathroom to keep it smelling fresh. No synthetic ingredients. No artificial coloring. No animal testing. Not diluted. 100% natural pure grade Sweet Orange essential oil.